The rumored device was supposedly given to a teacher (actually, two whole classroom sets of 24 calculators) to pilot his classroom with. According to the source, only known as “0rac343,” the calculator is still running OS 2.55 and is only slightly different than the existing TI-84 Plus calculators. The story, which originally debuted on the Cemetech forums, also indicates that the programming language (TI Basic) remains largely unchanged from the older TI-83 Plus and TI-84 Plus, which both use the same syntax. As with many others, I am slightly skeptical about the whole story. 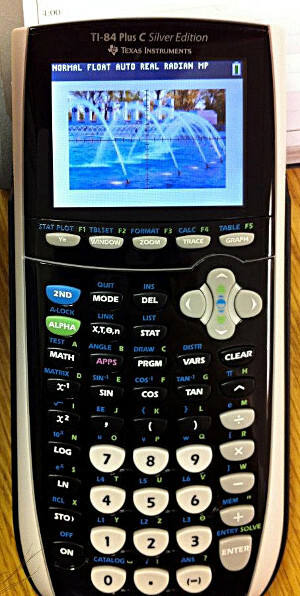 After all, TI has an amazingly powerful calculator and operating system that it has been transitioning to recently: the NSpire. Backtracking and reviving their old TI-84 Plus format can be considered a step backward, and may confuse individuals and book publishers that have been getting used to the new TI NSpire and rewriting texts for the new format. The TI NSpire also has two different models– a less expensive grayscale calculator, and the TI NSpire CX, which is designed to compete with the similarly featured Casio Prizm. TI could take this approach with the TI-84 Plus family, and provide the inexpensive monochrome TI-84 Plus in addition to this new TI-84 Plus C Silver Edition. This would divide their calculator product line into two main segments– the newer, more advanced TI NSpire, which has capabilities such as 3D graphing and chart generation, and the elementary TI-84 Plus product line, designed for younger students in Pre-Calculus and Algebra/Geometry. Additionally, each of these two families would be subdivided once more and provide a less expensive entry model in addition to a more advanced calculator with a color screen. In any event, as the supposed Spring launch window approaches, it’ll be interesting to see if TI makes another attempt to diversify the aging graphing calculator market. 2 Responses to TI-84 Plus C Silver Edition: Is TI Reviving their Old Calculators with Color? IS THAT A COLOR DISPLAY? Does “Mario 2.0″ work on the color version? If not, PLEASE update! !